So you might have heard that I went through this crazy thing where I had a sick cat and that I’ve gone to considerable lengths to get her better. She’s my Marla and she’s been with me for over 10 years now. It all started when my family was staying in cabins at the lake near my sister’s house and all alone in my little cabin, I hear a knock at the door. It’s my sister with this little gray kitten and a disposable cake pan of litter. She was so little that I slept terribly that first night, so worried I would roll over on her and hurt her. But my Miss was fine that night and absolutely golden for the next 9 years. But then, one day seemingly out of the blue, Mar went missing. I noticed that I had cracked the guest room window open just a little bit too much, realizing that Mar could have gotten out of it easily. Panicked at 10 pm Rob and I wandered our dark neighborhood calling for our girl. Making things ridiculously difficult is the fact that there are so many stray animals in the Rio Grande Valley. And while our neighborhood is better about it than a lot of others, Rob and I found no less than 3 cats that in the dark looked to be her. But unfortunately, none actually were her. Angry with myself for messing up and crying in the guest room I heard a noise on the other side of the now closed window. Mar wanted to come back home! Huzzah! Having been ill for a while and under the care of her vet I noticed that my gray girl seemed really run down, but I figured it was from the stress of her day as a runaway. That next morning, though, I called the vet noticing her increasing distress. 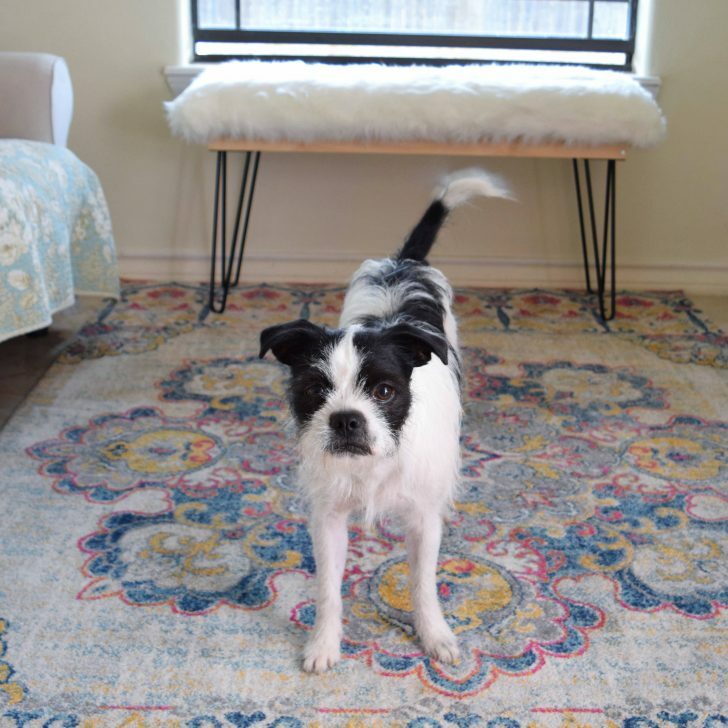 It turns out that Marla’s vet wasn’t doing a great job and Rob rushed her to a new, highly recommended vet the next town over. After visiting 4 different vets (2 of which are specialists and 1 of which was to verify her diagnosis in the whole second opinion thing) Marla has had 2 surgeries and is now down to 1 kidney and only 9 teeth. Poor girl. She’s doing so much better, though, and after 9 months of hiding under the sofa, she’s starting to come around. In fact, she sat with me in my office for an entire day this week. 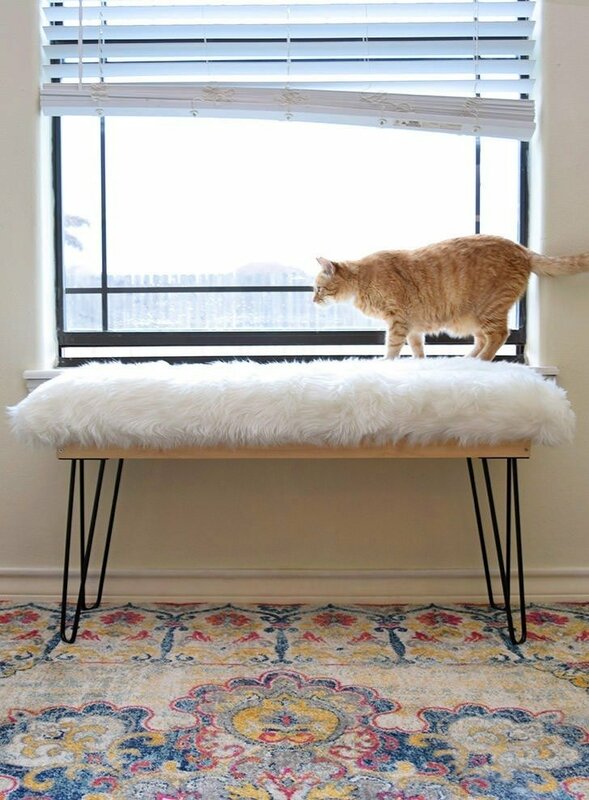 Knowing how much she loves looking out of the windows and soft, fuzzy things I decided to make her a bench so she can easily enjoy both. Perhaps her new bench will help bring her out from under the sofa even more! First, we’re going to make a frame to support the plywood seat of our bench. This is just going to be a simple rectangle that is a few inches smaller than our plywood that will rest on top of it. 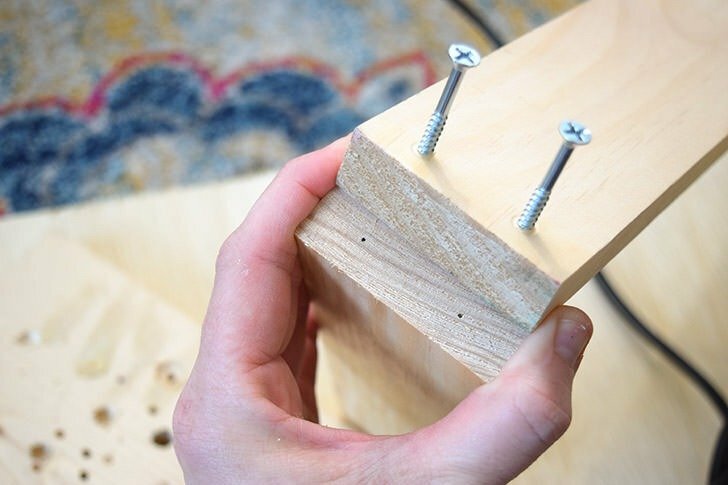 To start you’ll need to pre-drill holes with a drill bit smaller than your screws onto the edge of your first 39″ board. Be sure to bring them close enough to the edge that they match up with the center of an 8.25″ piece to form an L shape. **Quick tip, predrilling holes reduces the possibility of accidentally splitting your wood. 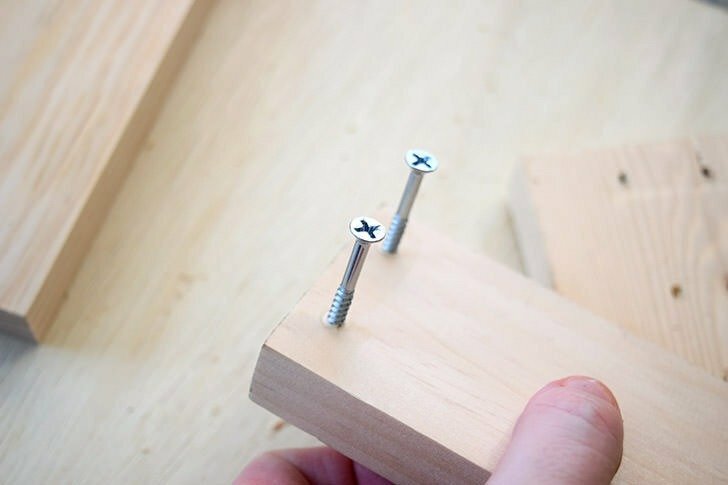 I have found it also helps you to drill your screw in straight so that it doesn’t veer off and come out of the side of your wood. 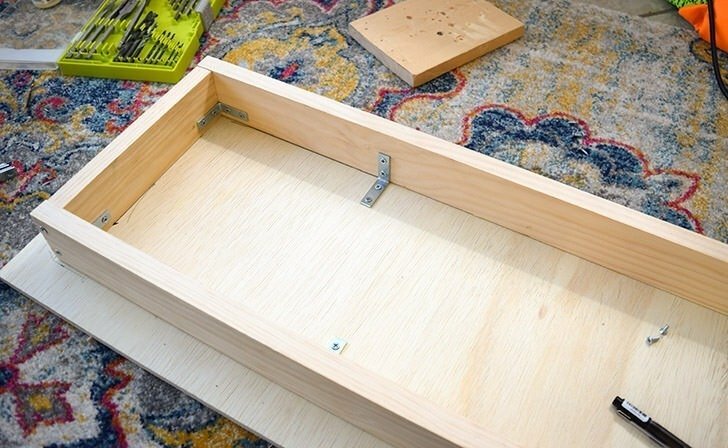 Start 2- 2″ screws into the holes you have drilled. 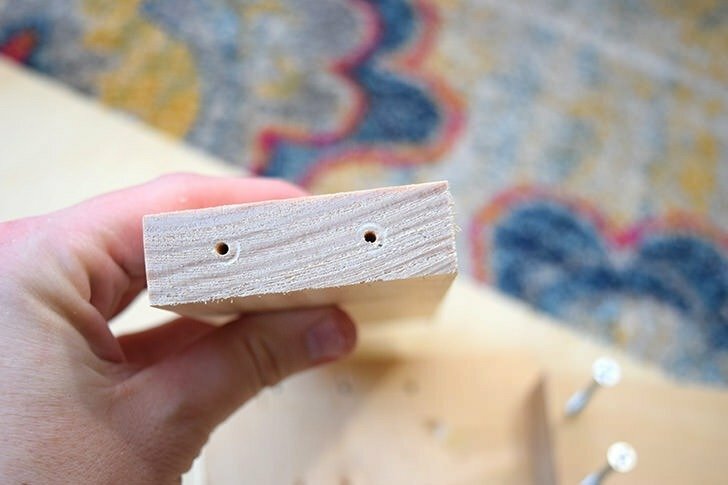 You want the sharp tip of your screws to peek out on the other side of the wood. Mark both tips with a permanent marker. 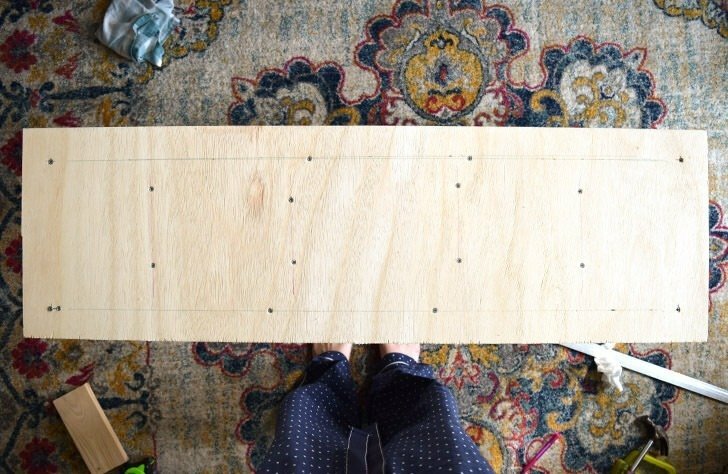 Press your larger board, and the screws it holds into your 8.25″ board to make an L shape. The screws will leave marks where they match up with its new mate. Pre-drill the holes into the 8.25″ piece to match. 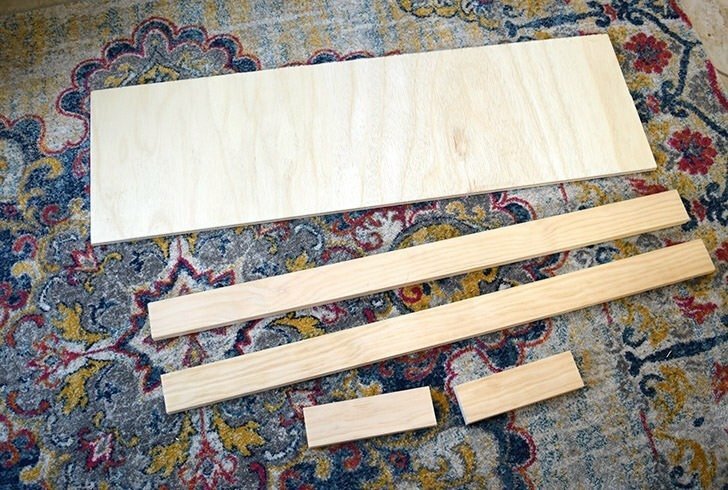 Apply wood glue to your pieces and then attach the 39″ piece to the 8.25″ piece making the L shape. At this point, you can also reinforce the corner with an angle bracket. 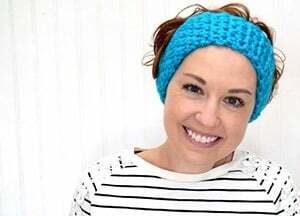 Repeat for the second 39″ and 8.25″ pieces to create another L shape. Put both L shaped pieces together, again drilling through the edge of the longer boards into the shorter to create your rectangular frame. You can also those corners with angle brackets. 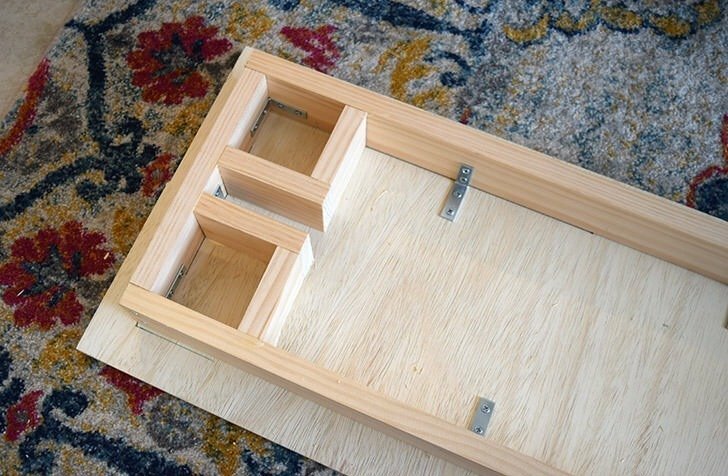 Place the frame in the middle of your plywood seat. Once you’re happy with the position, glue into place using wood glue. 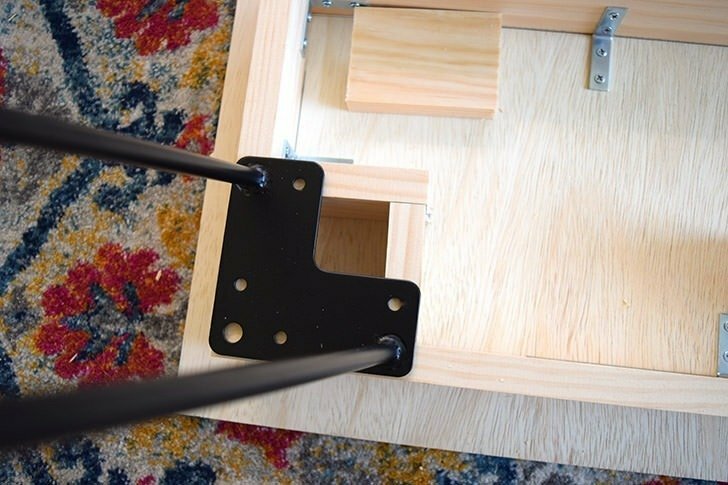 Attach the frame to the seat in multiple places using 1.5″ angle brackets and 0.5″ #6 wood screws. You can add the metal brackets while the glue is still wet. Next, we’re going to make blocks to attach our hairpin legs. In all honesty, this was done on the fly, not in the plans at all. I had built the top of my bench while waiting for my legs to be delivered and, as it turns out, I didn’t quite understand how they would attach to my seat. In order to fully fasten the legs I got, and you can get, too, you’ll need to make wood squares in each corner of the underside. 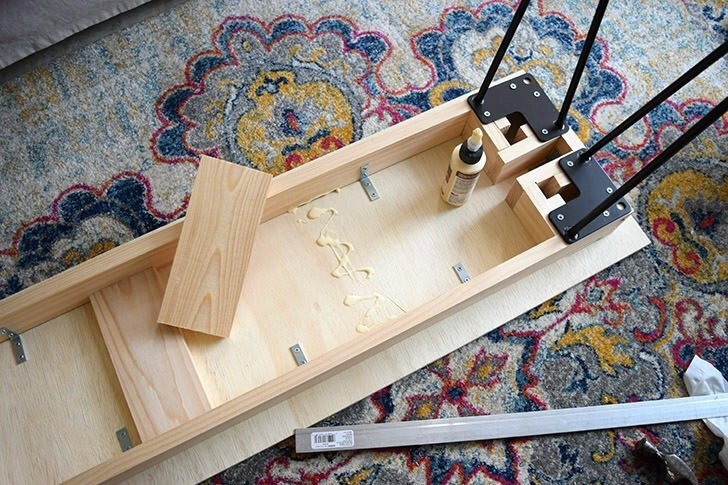 Using one 4.125″ and one 3.625″ piece, with larger of the 2 being placed parallel to the longest side of your bench’s frame, glue each wood piece to the plywood and the frame using a healthy amount of glue everywhere your piece makes a connection. Repeat for all corners and allow the glue to dry overnight. 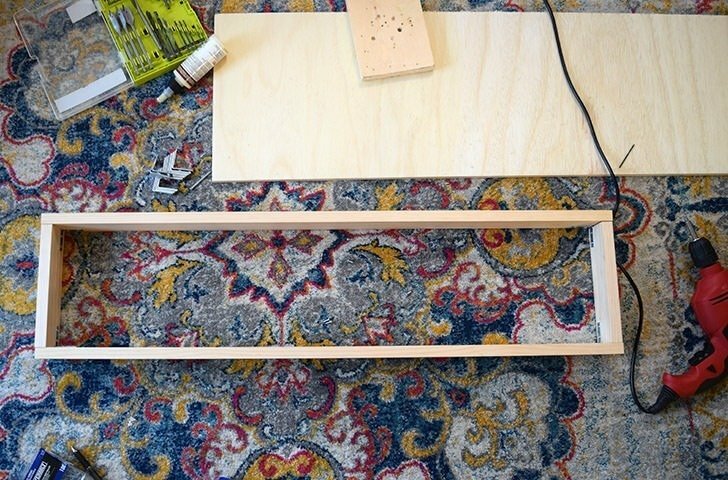 Once the glue has dried attach your hairpin legs with 4 #6-1″ wood screws per leg. By the way, I should mention that I have wanted to make this bench for AGES but the cost of hairpin legs has totally put me off. I whipped this sucker together within days of realizing that they have gotten really affordable on Amazon. Now the set I got is sturdy and seems really well made but they don’t come with screws so you’ll need to pick some of those up. #6 wood screws work really well. At this point, I was all excited that I had built a bench from scratch all by myself and showed Rob that it could easily hold my weight. But after he came over to flop down right in the middle of it I panicked and decided a little extra support underneath the bench wouldn’t hurt. Using scrap wood you already have (mine is 1×6 pine) cut 4 8.25 inch pieces. 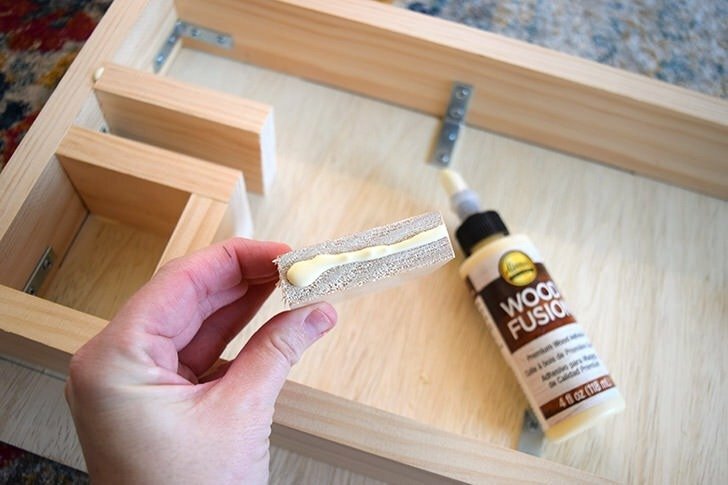 Apply a healthy amount of glue onto the seat and the frame and smack the supporting wood inside of the frame with a hammer if it’s a tight fit. Repeat for a total of 4 supports and this sucker is much sturdier! Give the glue a little bit of time to begin setting up. About an hour should do. 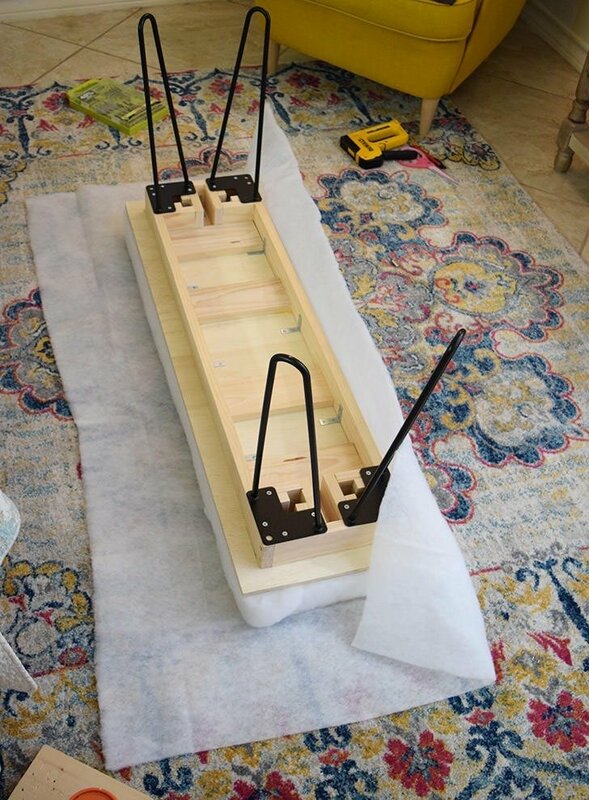 Since we are upholstering the top of this bench we can drill through the plywood seat to secure it super well to the wood frame and supports beneath. 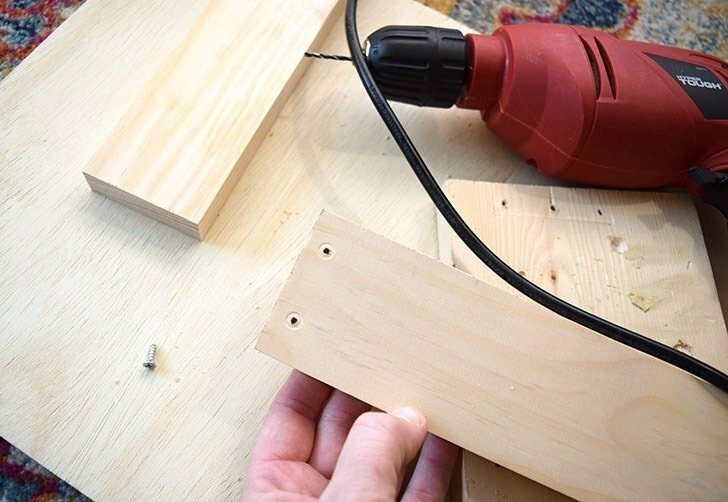 Remember to pre-drill your holes and begin attaching the plywood seat to the wood beneath using #6 2″ wood screws around the frame and corner braces for your legs. Use whatever length of screw that works for your additional support pieces from scrap wood (I had to use 1″ length). 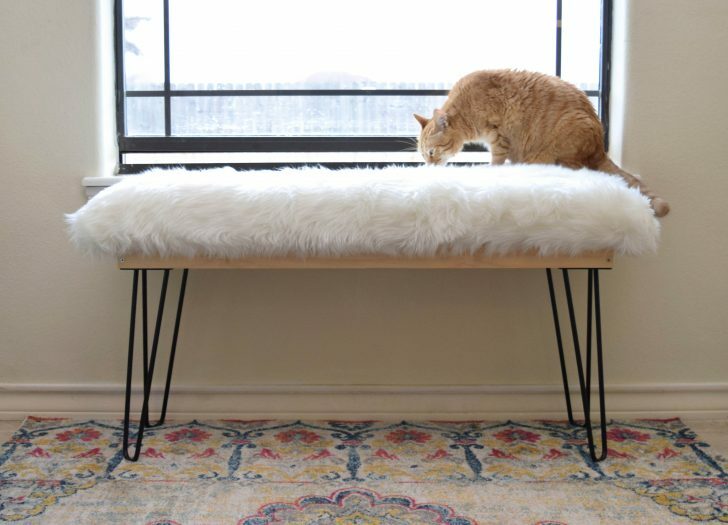 I wanted my bench seat to be exactly the height of the window sills along the backside of the house so that the cats can sprawl across the bench and onto the sill comfortably. As such, I needed 3 inches of foam on top of my plywood for this perfect fit. But 3″ thick foam is expensive! Instead, I purchased a roll of 1″ foam at Michaels for $15 with a 40% off coupon and layered the foam to get my 3″ deep. Placing the bench on top of the foam I cut my first piece tracing along the wood’s edge. I then cut another full sized piece using the first piece as a template. Next, I worked with the scraps to create 2 smaller pieces that match up to the same size. With the cut pieces sandwiched in between the whole pieces of foam, I wrapped the entire business in quilt batting to keep the 3 pieces together in place. Place a piece of quilt batting larger than the bench by about 6 inches all around onto the floor. 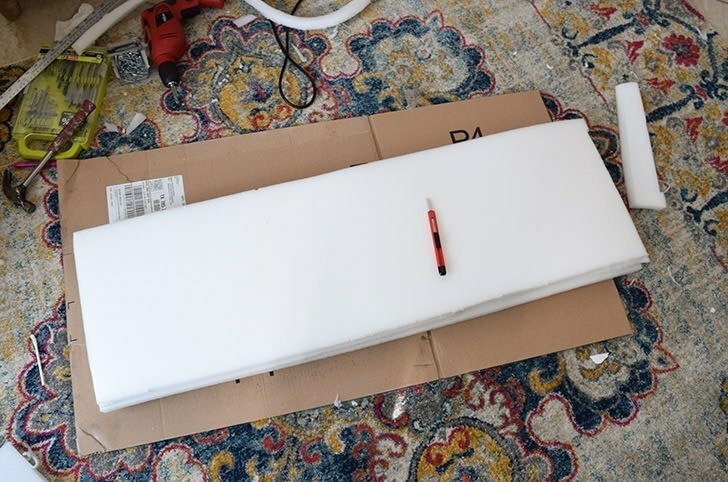 Place your upholstery foam right in the middle and then place your bench on top of that. 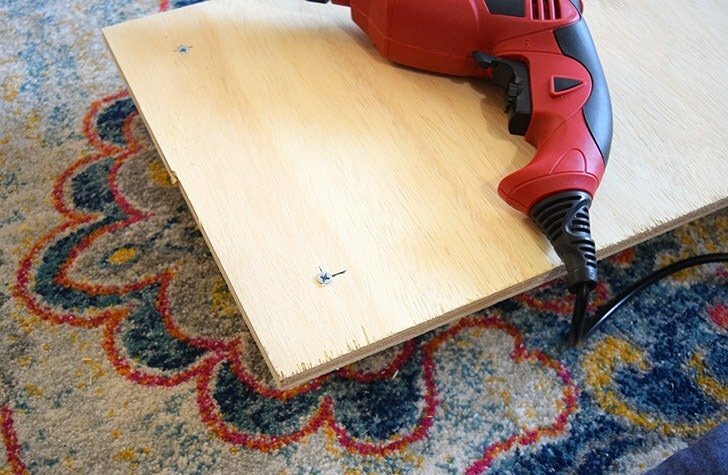 Use a staple gun to affix the batting onto the underside of the plywood seat about an inch or so away from the wood’s edge. Secure the batting every few inches and when you get to the ends fold the fabric in like you would when wrapping a present. Trim away the excess batting using a pair of scissors. 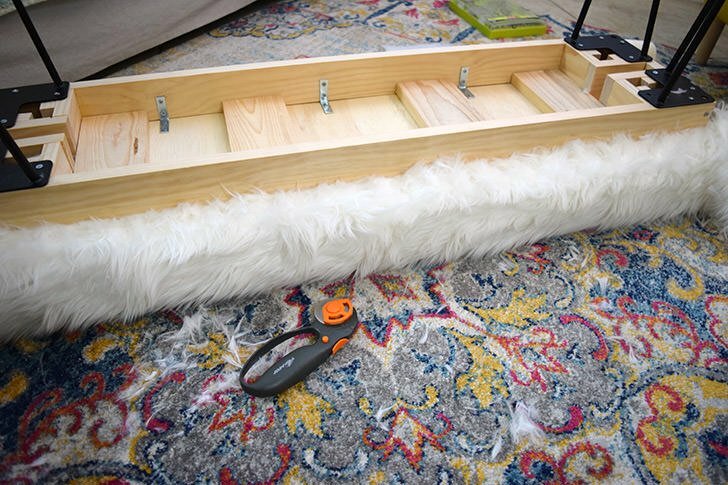 Now place your faux fur fuzzy (pretty) side down on the floor, centering your bench in the middle. 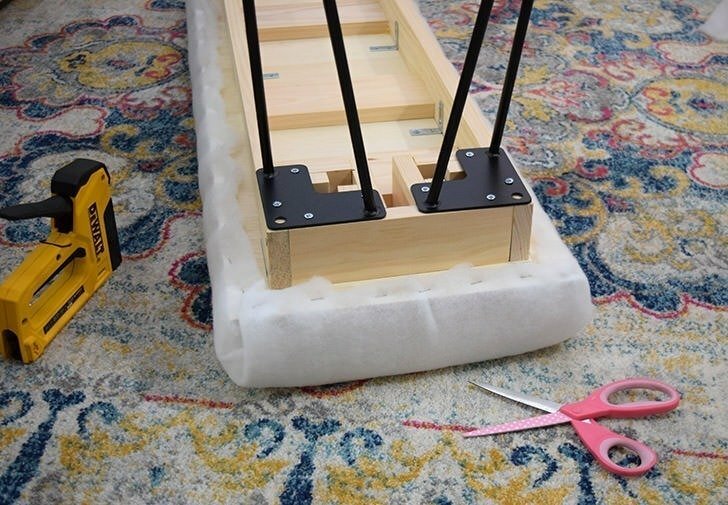 Bring the fabric up and tack it to the plywood seat portion of the bench right up against the wood support frame. Tack the fabric on down every inch or so all the way around the bench. Run a razor blade or a rotary cutter along the corner where the plywood and frame meet to remove the excess fur fabric. FYI, this will get very furry and messy! While you’re removing the fur that has cut away you can also easily brush your fingers over each the fabric to hide the staples beneath. Seriously, it’s pretty awesome how the staples just disappear! Flip your bench over and set it near a window and just wait for the cats to appear or for it to just look pretty :) So far my Marla girl has only graced the bench a single time, that I know of, and she took off back under the sofa once she saw me, but I have a good feeling about this. After all, baby girl CANNOT resist soft and fuzzy faux fur for anything in the world! And I suppose sweet JouJou can always break it in for her! Oh, and before we go let’s tally this project up, cost-wise. 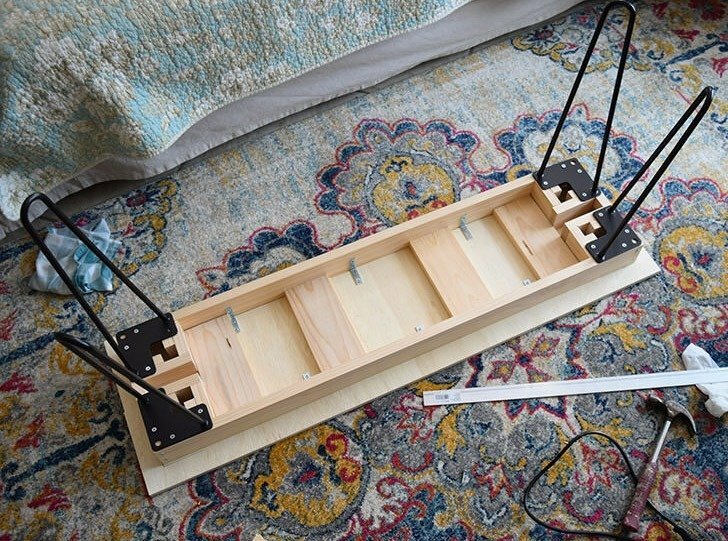 With smart shopping and digging into the stash, this can be an extremely affordable bench build. Here’s what I could have spent. Hairpin legs, $24. Wood frame pieces $9. Plywood seat $14 (they’ll cut a 2×4 sheet to the right size for you at most home improvement stores). Upholstery foam $15 with 40% off coupon. Batting $6 at Michael’s with 40% off coupon. Angle brackets $4.50. Faux fur fabric $14.26 at Hobby Lobby with 40% off. Screws about $6. I was able to dig a lot of stuff out of my stash but if I bought everything it would cost me around $90. In actuality getting into the wood offcuts I have from other projects and digging around in my stash I was able to spend only $60. Pretty sweet, right? 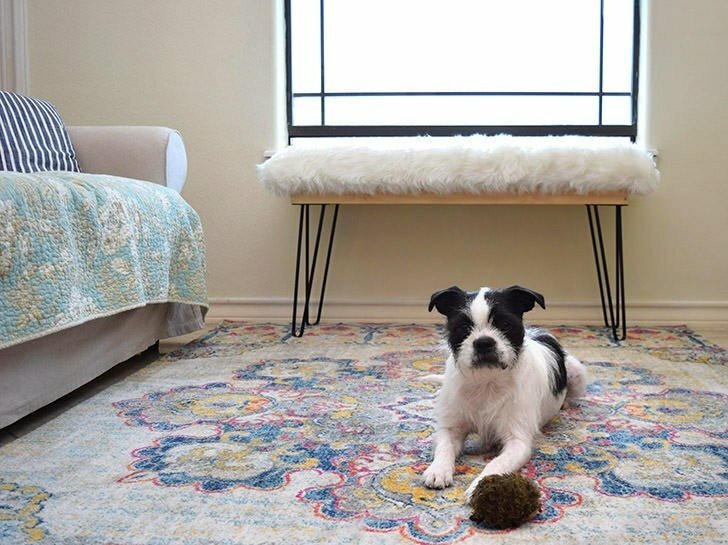 I mean, considering the 2 benches I was looking at online were in excess of $200, like this much smaller version is $240 with shipping and this guy at Wayfair is $273 I’m super stoked about my bargain price!